St Gabriel’s life reveals that a profound love for the Mother of Sorrows is of the very essence of the Passionist charism, for it was Mary who appeared to young Paul Francis Daneo, the Passionist founder, and called him to found the Congregation. 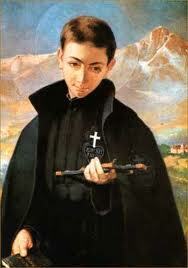 Francisco Possenti was born in Assisi on 1 March 1838, the eleventh child of Sante Possenti and Agnes Frisciotti. The first year of his life was spent away from his family with a nursing woman who cared for him because his mother was unable to do so. In 1841 Sante moved the family to Spoleto where he was appointed magistrate. In that same year, the youngest Possenti child died at just six months old; Francis’ nine-year old sister, Adele, soon followed. Just days later, his heartbroken mother too was called to eternal life. Francis had lost his mother at just 4 years old. Tragedy continued to plague the family during his youth. In 1846 Francis’ brother, Paul, was killed in the Italian war with Austria. Another brother, Lawrence, later took his own life. Such events, however, did not rob Francis of his spirit and cheerfulness. During his formative years, Francis attended the school of the Christian brothers and then the Jesuit college in Spoleto. He was lively, intelligent and popular at school. At sixteen, he suffered a life-threatening illness. Praying for a cure, Francis promised to become a religious. With recovery, however, he quickly forgot his promise. But God’s call would not be denied, and Francis soon turned his heart to the Congregation of the Passion. Sante Possenti was less than pleased with his teenage son’s decision. Determined to show Francis the joys of a secular life of theater and society parties, Sante continued to hope Francis would find pleasure in a social life. But the young man was not to be dissuaded. Immediately after completion of his schooling, he left for the Passionist novitiate in Morrovalle. In the novitiate, he cultivated a great love for Christ Crucified. Francis received the Passionist habit on 21 September 1856, which that year was the Feast of the Sorrowful Mother. He was given the name Gabriel of the Sorrowful Mother. A year later he took his vows. His monastic life preparing for the priesthood made Gabriel a secluded, non-public figure. His writings reflect his close relationship with Jesus and His mother. The people of Isola would always remember him as “their Gabriel.” Struck with tuberculosis at the age of 24, Gabriel died before his ordination to the priesthood. His fidelity to prayer, joyfulness of spirit and habitual mortifications stand out in his otherwise ordinary life. Pope Benedict XV canonized Gabriel in 1920 and declared him a patron of Catholic youth. His patronage is also invoked by the Church for students, seminarians, novices and clerics. Thousands of divine favors are attributed to his intercession with Christ Crucified and the Sorrowful Mother Mary.